Coyote Oak Journal Home The Coyote Oak Journal · Nature Notes, Queries and Commentary "Photography & Adventure for Those of Us Who Would Rather Be There, Than Here!" Copyright ©1995-2016 Gary Valle'. All Rights Reserved. Copyright © 2001 Gary Valle'. All Rights Reserved. There's a Santa Ana wind today and temps are warming back up. More than a week has passed since it rained and the ground is not nearly as muddy. That's good and bad. It's good because my running shoes aren't getting so caked with mud anymore, but it's bad because the damp ground is great for looking at animal tracks. Reading tracks can be very rewarding. The more you see the more you learn, and the more you learn the more you see. It's another aspect of the natural environment that gives you insight into Nature's wholeness and interconnection. 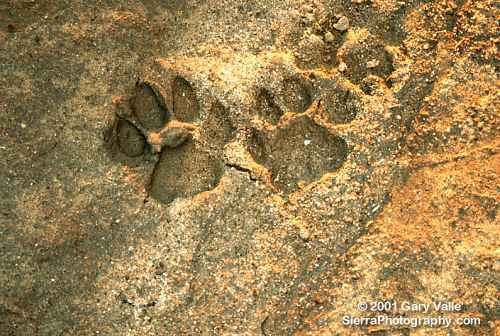 These mountain lion tracks show the round, clawless imprint typical of felines. A distinguishing characteristic of feline tracks is the bilobed front edge of the plantar pad. Compare to these coyote tracks, which are more oblong, have claw marks on the two leading toes, and a more narrow, single lobed plantar pad. 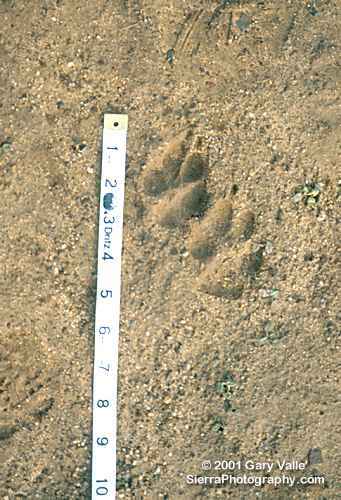 In this photo the track of a hind foot is on the left, and front foot is on the right. The hind is slightly smaller and only shows the central area of the plantar pad. A book that I have found to be an invaluable reference is Tracking & the Art of Seeing : How to Read Animal Tracks & Sign by Paul Rezendes. Another book I refer to frequently is Field Guide to Mammal Tracking in North America by James Halfpenny. 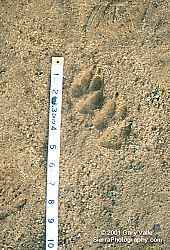 It saddens and angers me that the mountain lion that made these tracks was killed in late 2004 by eating prey (coyote) that had eaten rodents that had consumed anticoagulant based poisons. These poisons are used by parks, schools, golf courses and housing developments for rodent control. For more information see "Deaths of two mountain lions blamed on use of rodent poison." For additional updates see the post Mountain Lion Saga on my blog PhotographyontheRun.com. Copyright © 2000-2014 Gary Valle'. All Rights Reserved.